* Due to the remoteness of Hin Muang & Hin Daeng, we propose only private speed boat scuba tours or liveaboard. Please contact us for more information. Welcome to a new level of scuba diving day trips experience in Phuket. 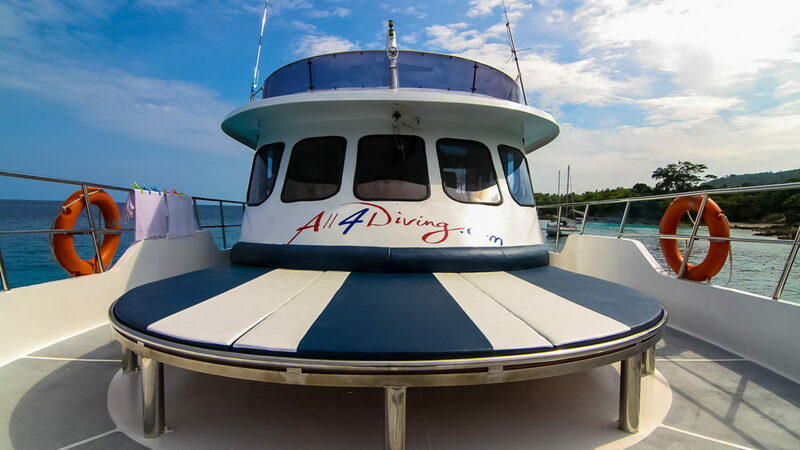 All 4 Diving has certainly the best and most comfortable dive trips yacht on the island. Our brand new designed yacht MV Mermaid will bring you to the best dive sites around Phuket, Racha Yai, Racha Noi, and Ko Phi Phi for unforgettable SCUBA tours. Let us share with you, our passion for diving, and show you the amazing underwater world of The Andaman Sea. Aboard of our diving yacht MV MERMAID, we offer our guests a comfortable and friendly dive trip no matter what your diver’s level is. We have daily dive trips & snorkeling to the best local dive sites of Phuket & Krabi area, running all year round. Our diving yacht MV Mermaid, with her 26m (86ft. ), is very spacious and specially designed for scuba diving day trips. The well-planned dive platform offers easy water entries and exits. Scuba divers can relax in the large and spacious lounge between dives, or sit under the large covered area on the upper deck. With our on-board resident chef, our guests and divers will enjoy delicious and freshly cooked breakfast and lunch. Between the dives, you can appreciate fresh fruits, bakeries, fresh coffee, tea and soft drinks all day long. Welcome to the wonderful underwater world of Phuket. Let’s go diving! Green Season - 21 May to 31 Oct.
➤ National Park fees at Phi Phi Islands - 600 THB per diver / 400 THB per non diver - payable cash on board. ➤ The schedule is subject to weather conditions. Scuba diving day trip for certified scuba divers. We go every day for 3 dives alternately to the Racha and Phi Phi islands. Check below the schedule. • Please remember to respect 18h minimum surface interval before flying – The end of the last dive is scheduled around 4PM – you can fly safely after 10AM the next day. Daily basis scuba diving insurance – coverage of 2,100,000 THB (£50,000 British pounds). Bellow detailed schedule of benefits. You need to be Nitrox certified. To book and secure your scuba diving day trip, we need full payment 2 days before the departure. During the high season, November to May, for late bookings – 2 days or less before departure, please check first with us the availability. We recommend that fun divers take out premium insurance that has larger coverage than the basic SCUBA insurance, such as search & rescue, emergency evacuation etc…, with 2,100,000 THB of medical coverage. * The hotel pick up / arrival depends of the area where the hotel is. MV Mermaid is a 26-meter steel yacht with double engine HINO 425HP. She is part of the flotilla of three boats that All4Diving owns. Two of them, MV Mermaid I & II, cruise in Indonesian waters. MV Mermaid is definitely the best and most comfortable diving day trip yacht in Phuket. With stabilizer wings and powerful engines, MV Mermaid provides unmatched comfort and safety even on a difficult sea conditions. She can comfortably accommodate 48 guests on the two large decks and one smaller top sun-deck. All meals onboard are served buffet style freshly cooked from the on board kitchen. Snacks and fruits are served in between dives. On the lower deck, even with a full boat there is plenty of space for everyone to sit and relax either during meal times or in between dives. Snacks and soft drinks (free of charge) as well as tea, coffee and water are available throughout the day. Just serve yourself. On the upper deck there is a large covered seating area where you can also take your lunch or relax. There is also a large sun deck with mattresses. This is a great place for the sun worshipers. The dive sites in Phuket and Phi Phi Islands area offer a diverse and rich underwater topography, ranging from submerged pinnacles and island reefs slopes to cliff-like limestone islands. They share the same biodiversity and beauty as those in Similan & Surin National Parks. However, dive sites of Racha and Phi Phi Islands have one advantage over those in the two famous national parks – scuba diving day trips are available throughout the year. Unlike most of the dive sites in South Andaman, which are close to the mainland and are therefore sheltered, the Similans are affected by the wet monsoon. Diving Holidays on Similans are only available from November to April. Although not all dive sites, like those of Phuket and Ko Phi Phi, are protected under National Park regulations. They should be treated as fragile environments. Please, protect and preserve them for the benefit of future generations. The average air temperature in Phuket area is 28’C and water temperature is 27’C. The period from November to May is considered the best season for scuba diving and dive trips in Phuket, Racha and Phi Phi Islands due to the calm sea conditions and limited rainfalls. From the end of May to October, the southwest wet monsoon sweeps through the area resulting in strong winds and rainfall. In spite of this, most dive sites remain accessible for scuba diving Phuket activities, even during the wet monsoon season, thanks to the fact that they are close enough to the mainland and they are largely sheltered from the prevailing wind.